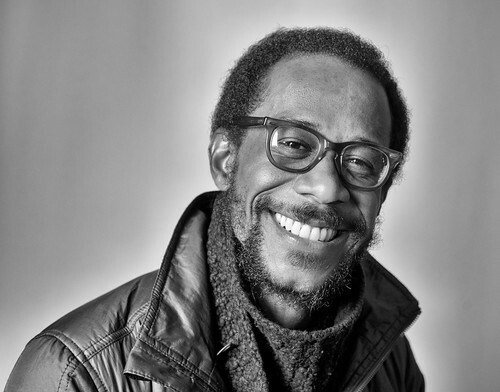 Brian Blade and Friends will perform a Mama Rosa session on Fri, Jan 30, at Bears Fairfield. In 2010 Blade performed that show at Naked Bean Cafe, Line Ave. In the audience was a performer, Maggie Koerner, on the cusp of a singing and song writing career. A Shreveport girl (Loyola Prep, LSUS), she has since migrated to New Orleans. Her recent record, Neutral Ground, is a highly-evolved, poetic and organic blues rock song cycle. Meanwhile, she has begun touring as a singer with Galactic. "I was fresh out of LSUS at 22, and my new path (same old dream) was to pursue a music career instead of the easier, natural continuance of school for a masters in counseling psychology. I had just met Brady Blade a few weeks back & that gave me some hope for the future. He told me that I should come hear his brother Brian play some songs at this little cafe on Kings Hwy. When the day came, I showed up 15 minutes early & the place was packed like sardines. I saw a few familiar faces including Brady who was, as always, busy talking to a million different people at once. I came solo & quickly found 1 lonesome seat on the front row so that's where I parked it until the show started. When it did, I knew instantly that I was in for a real and rare treat of a performance. Intimate and educating, Brian and the band blew my mind right open to a place I had never been to before with music. Little did I know that I was sitting there 2 feet away watching a living legend play, but that probably helped me experience the show in its purest form. The 2 things I remember most about the set was 1) the guitar player freaking me out with his talent, especially during his solo on "You'll Always Be My Baby" & 2) when they played "Second Home," I unexpectedly teared up. I felt such a strange and visceral connection to that song. It wasn't until I had been living in New Orleans for a year & a half & coming back home from a gig with my band, all huge fans of Brian, that I realized why I teared up. My guitar player, Chris, put on the Mama Rosa album in the van. When "Second Home" started to play and I understood every thing Brian was talking about through the lyrics, they had resonated in me because I had to get to my second home of New Orleans. I feel honored and grateful that I was able to meet Brian & Mama Rosa after the show. Such a special night that I have not nor will ever forget." The Tedeschi Trucks Band is largely out of sync with the modern world. First, they tour with 10 musicians. Cost-wise, that is not realistic. Derek Trucks, slide guitar monster, simply stands there and plays. Susan Tedeschi, the lead voice, is no longer young and willowy. Within the 10 man group are two full-set drummers. But they can blow your house down with soul, blues and rock tunes. Sample them on youtube. That they are performing at The Strand Theater, downtown Shreveport, is swell. Their music and this region's taste are a definite fit. 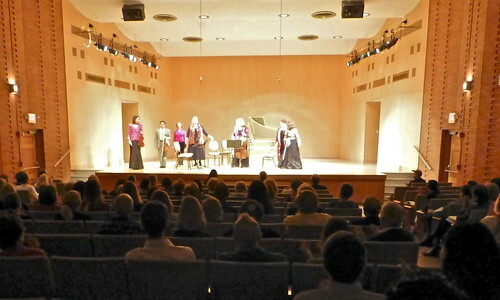 Tickets at the Strand are $75.00; $49.50; $39.50. Service fees then bump the price. My pair of $51 tickets totaled $117. The band is on a tour that begins Feb 1 at the Ryman in Nashville. They hit Shreveport after dates in Pensacola and Macon. The night after Shreveport they are performing in Memphis. On Ap 24 they're at NO Jazzfest. The tour ends with a series in France and Germany. Highly recommended, to say the least. I leave it to you to decide why they continue to make live music with all the horns and singers and drummers. Concerned Citizens' advocate Frances Kelley to the suits of Louisiana: "We are more stubborn than you are"
"I just want to warn the EPA, the Governor, the President, DEQ, the Louisiana Congressional delegation and any others that have the power to resolve this situation at Camp Minden and dispose of the explosives using a safe method, that we are more stubborn than you are and we will not go away until it is done," said political activist Frances Kelley on social media. Kelley's statement may seem overly dramatic to those who have not watched her at work on regional issues such as rights for women and minorities or on the containing the abuses of the oil industry. She is a relentless and insightful worker, says Planned Parenthood chief Melissa Flournoy. Born and raised in Shreveport (Caddo Magnet HS) and educated at Yale University (08, religious studies) Kelley is involved in politic effort from North Louisiana to Baton Rouge. She has spent hours and hours working for the causes espoused by Louisiana Progress, Equality Louisiana, 350.org, and Planned Parenthood. She has also been active in electoral campaigns for Jeff Everson, Ollie Tyler and Stephanie Lynch, among several. The establishment of Shreveport's Human Rights Commission involved a great deal of Kelly's effort. "She is so principled and earnest," says city council member Everson, "and so passionate about causes." Her talent in community organizing, he says, is about "being able to reach out to people in a direct way." An advocate for a wide range of causes, Kelly has not become a professional organizer. She pays bills by teaching swimming. Kelley, a grad of the Vermont-based School for International Training in addition to Yale, is simultaneously working on a Masters in education at Centenary College. Her primary focus is the environment, social justice and aiding grass roots organizations. "She can crunch numbers," says Everson, "and has a good grasp of predicting people's behavior." Adds Flournoy: "Her energy, passion and commitment are motivating citizens and elected officials to be better informed and take action. Frances is a tireless advocate and community organizer who is making a difference in our state." 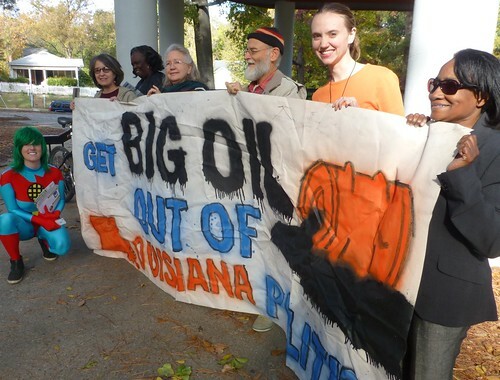 Says LSUS prof Brian Salvatore, "Through working with Frances in the Concerned Citizens group, I have come to witness a young person who not only has a powerful social conscience, but also the passion and the drive to achieve real results. She also has the vision and the managerial skills to inspire and direct others in how to best channel their own efforts." Salvatore adds, "To see all this leadership ability wrapped up into an individual who displays a quiet demeanor under most circumstances is really quite remarkable. Frances has given me a lot of hope for America's future." Touring Europe and the US continually, Brian Blade is at a pinnacle of recognition as a jazz drummer. Blade's group, the Fellowship Band, is up for a Grammy for the album Landmarks. He's a steady partner to jazz legend Wayne Shorter. He even had a part of the Antonio Sanchez drum score for the movie Birdman. But when he performs at Bears this week - seated, with an acoustic guitar in his lap - people in the Shreveport audience will see Blade the singer-songwriter. It will afford Blade fans a window to his soul - after, all Mama Rosa is a song about his grandmother and about Shreveport. Blade also gets to show the audience the broader world of music he inhabits. Guitarist Mark Griffith reported from rehearsals that they will do a Link Wray tune as well as a Dylan number. That's in addition to an entire suite of folk-rock, mid-tempo tunes penned by Blade. His vocal partner will be his Shreveport comadre of many years, gospel singer Monica Blake Mickle. Expect to see Shawn Stroope on bass and Lane Bayliss on drums, says Griffith. It's not going to be a night of dance, though from time to time crescendos will be thunderous, says Griffith. "Maybe a few hippie chicks swaying to some of the tunes," went the joke at the Blade rehearsal. When last he performed the Mama Rosa session - Naked Bean Cafe, Line Ave, 2010 - the waves of energy that rolled out from Blade and group were like sonic surf at midnight. All that and no smoking, too? Last week Chase Boytim declared Bears to be a full time no smoking zone. Hats off to Boytim, a serious student of entertainment and how to bring it. It's a family and soul night for Blade and Shreveport. Highly recommended. Tickets are $15 online and 20 at the door. "It will sell out," says Boytim. Locals may also drop by Bears this week to buy a ticket for 15, no handling charge, says Boytim. 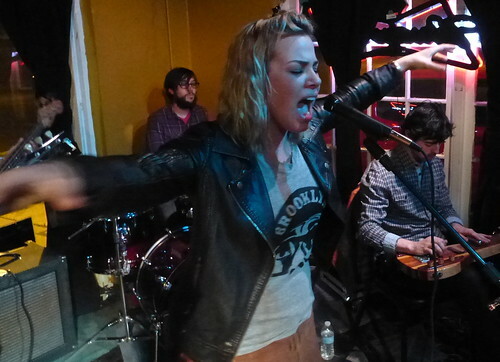 Please see singer Maggie Koerner's reminiscence about Blade's 2010 show at Naked Bean. 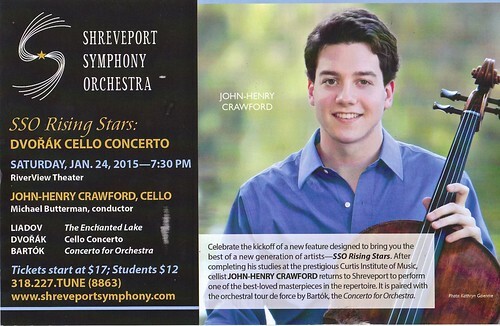 Handsome and young, expert and serene, John-Henry Crawford, guest cellist with the Shreveport Symphony Orchestra on Sat, Jan 24, brings palpable pleasures to the audience. 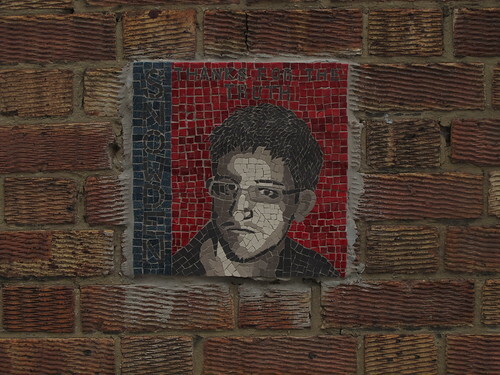 RFC hosts a Q&A screening of Oscar-nominated documentary Citizenfour at 6 pm, Jan. 22, with guest Shreveport Times Executive Editor Alison Bath. The film "dramatically straddles the divide between art and journalism, cinema and reportage," says The Guardian, and plays as "the most chilling thriller of the year." Also speaking: Chief Technology Officer of Enterprise Computing Services Ken McCoy. McCoy has worked in IT for both large and small customers across the country as well as on government contracts, specializing in security. He has many top IT industry certifications and is one of the few Cisco Certified Internetwork Experts in Louisiana, says RFC. 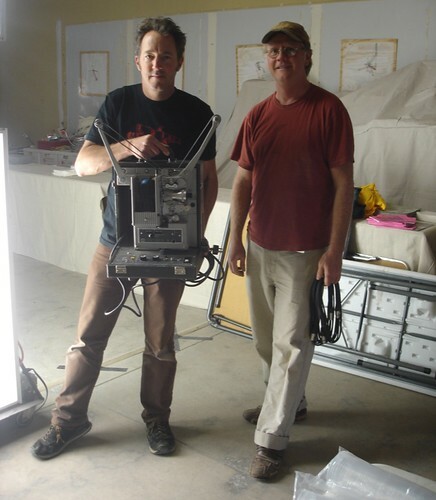 Image-maker Bill Daniel is an art fox. Affable, handsome, caring, he shoots film and moves on - without his subjects having noticed. Daniel is considered one of America's coolest documentarians. Exhibits of his work have been seen recently at the Berkeley Art Museum, the San Francisco Art Institute and MOCA Los Angeles. 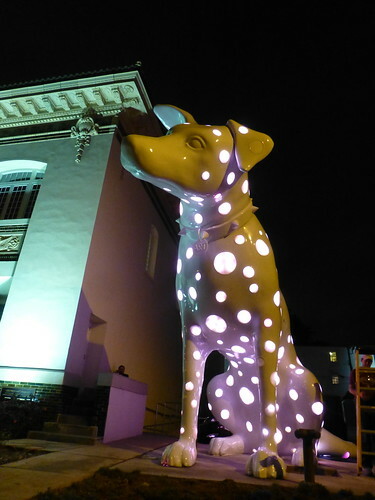 A winner of a Guggenheim fellowship, he exhibits coast to coast and in Europe. The Daniel show to be exhibited at minicine? on Tues, Jan 20, is Tri-X Noise. Also presenting at minicine is New England Home Movie Tour. Among its handmade shorts is work by Luther Price, a major American artist whose work at the Whitney Biennial 2012 was considered tout le tout. minicine?, a creation of David Nelson, has produced most of its exhibits and concerts of recent years at 846 Texas Ave. Regrettably, building code issues were the impetus to close 846 Texas Ave some 2 years ago and end that phase of minicine history. Does this show represent a return of the salon on Texas Ave? Says Nelson, "The space @ 846 is not officially reopening at this time. No updates have been made to make regular programming possible. A fire inspector has been hired to be on hand for this event in order to comply with city requirements. For the last two years, the space has been turned into more of a working studio and now everything has been pushed to the corners for this event. So the space has been cleared out particularly and especially for Tri-X Noise and the New England Home Movie Tour. No future programs have been scheduled." Doors open 7 to 10 pm; films roll at 8 pm. Donation: $5 or $10. 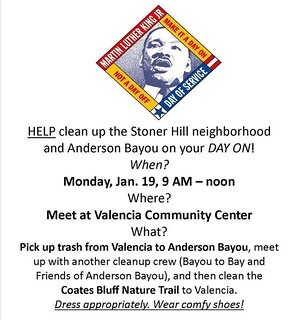 'We will be picking up litter in and around the Anderson Bayou area on Mon, 9 am to noon," says Jon Soul. "Canoes (and life jackets) will be available for litter collection on the water." Cleanup equipment and snacks provided. Meet at the Zeke Drive playground at 9AM. A related cleanup effort is beginning at Valencia Park / Community Center at 9 am, says Shalon Lewis. 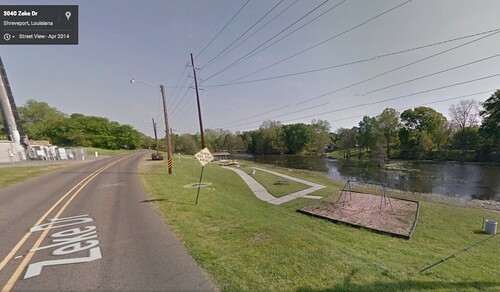 The Valencia volunteers will work their way toward Anderson Bayou, the two groups meeting at the bayou, says Erin Berry. Please see photos of the volunteers, the bayou and the work done on Mon. 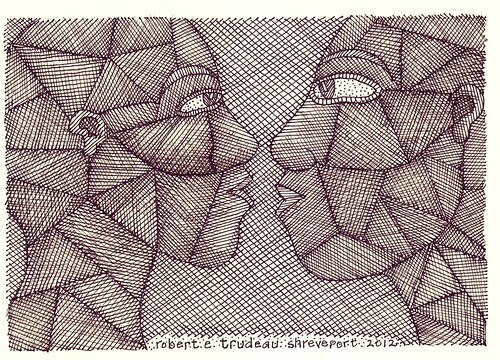 at flickr.com/robert_trudeau. Exquisite chamber music by the region's best and most dedicated musicians, performed at Centenary's Hurley Music Bldg, Anderson Aud, 2 pm, Sun, Jan 18. No charge to the public. All are welcome. Dance party. Mardi party. Stand too close to the Soul Rebels front line of horns and you risk seeing your hat fly into the crowd behind. You also risk finding a new set of muscles from the dancing you will be doing. The Soul Rebels are a big band, have a big rep and they play tunes that the crowd knows, from "Happy" to "Sweet Dreams." 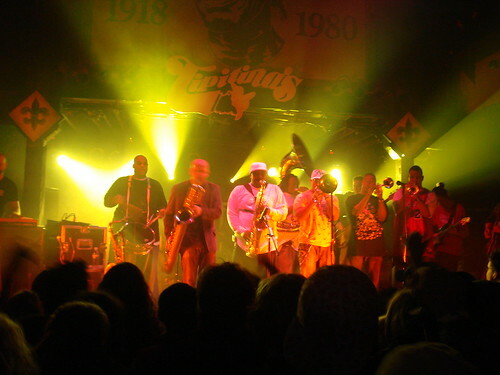 Check a Soul Rebels video if need any further impetus to live your life as though you were in New Orleans. "We strongly believe that women should not be forced to contend with elected officials and private interest groups who seek to take away our basic human rights to our own bodies," says Debbie Lynn Hollis of the Shreveport-Bossier chapter of the National Organization of Women. Hollis says a peaceful protest - and public education event - will take place Sat, Jan 17, from 10 am to noon at Festival Plaza in Shreveport. "The primary goal for this event - Stand for Women's Lives - is to educate the public about the legally-protected reproductive rights available to all women," adds Hollis. It should be noted that the NOW protest will take place in the center of the Louisiana Life March North. It is a Right To Life march from Louisiana Boardwalk across the Texas Street bridge to end in a gathering in Festival Plaza. It will feature nationally-known speakers and prayer. The Right To Life gathering aims at shutting down the legal abortion clinics in Shreveport and Bossier. 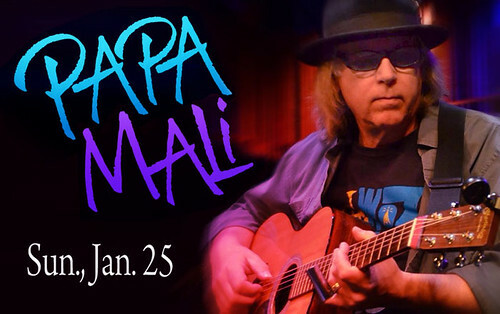 Papa Mali wails a roadhouse blues that reaches up from a dank hole in the ground to the rafters. In his role as slow-water shaman from the Shrescent City, he can make his blues strut and gator. Or, psychedelicized, Mal's blues can curl past the rafters and re-arrange the shingles on the roof. Having spent half a man's life entertaining people in smoky venues, when he sings at smoke-free 1508 Fairfield Ave (formerly Fairfield Studios) he might add levitation to his chops. It's a solo, acoustic show. Opening is AJ Haynes. Brent Havens, conductor, would be the monster in the room for the Shreveport Symphony Orchestra's presentation of the Music of Pink Floyd on Sat, Jan 17. Havens is Arranger/Guest Conductor for eleven symphonic rock programs – the Music of Led Zeppelin, the Music of the Doors, the Music of Pink Floyd, the Music of the Eagles, the Music of Queen, the Music of Michael Jackson, the Music of The Who, The Music of Whitney Houston, the Music of The Rolling Stones and most recently the Music of U2. 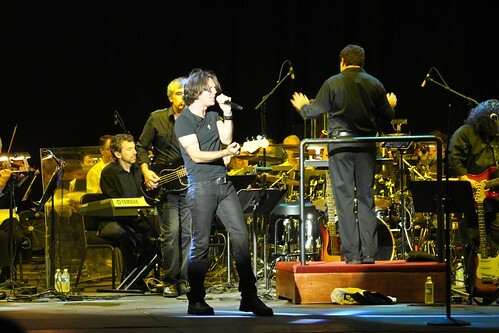 Havens has also created a full orchestral show for Lou Gramm, The Voice of Foreigner, with Lou singing out front. The two-hour-plus concert features a massive light show timed with more than 15 Pink Floyd tunes, says the SSO. Tickets here. 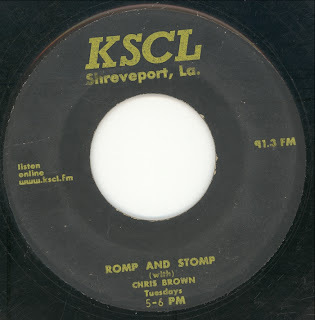 The tenth annual all-Shreveport radio show on Romp and Stomp is scheduled for Tuesday, January 13, 2015, from 5:00 to 6:00 pm. Tune in to KSCL 91.3 FM or listen live online at www.kscl.fm. You’ll hear songs by Shreveporters, songs about Shreveport, songs recorded in Shreveport, and songs released on Shreveport record labels. Featured musicians include: the Douglas Williams Four, Hot Rod Happy, Norman Nettles, Pete Hardin, Merle Kilgore, Blues Kings, Wolfman Jack and the Boogie Kings, Johnny Bullock & the Jamboree Showboys, Gay Poppa, Dorothy Whitehead, UPC Trio, and more. 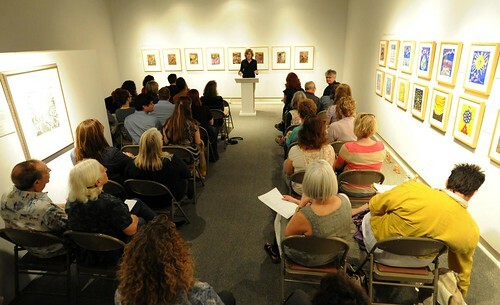 Poetry at the Meadows Museum of Art at Centenary College will feature a reading and book signing by Dr. David Havird, author of Map Home (Texas Review Press, 2013) and Ashley Mace Havird, author of The Garden of the Fugitives (Texas Review Press, 2014, and the X. J. Kennedy Prize), to be followed by an open mic session, for which sign-up begins at 5:30 pm. The event, free and open, goes to 7 pm. The reading and reception happens in conjunction with the exhibition "Poet of the Ordinary: Photographs by Keith Carter" on Th, 15 Jan, from 5:30 to 7 pm. The event is free and open to the public. Readers are encouraged to visit the exhibition and compose a poem in response to the photographs. The Museum is free and open to the public Tues through Fri from 11 a.m.-6 p.m. and Sat from 12 p.m.-4 p.m. 318.869.5040. 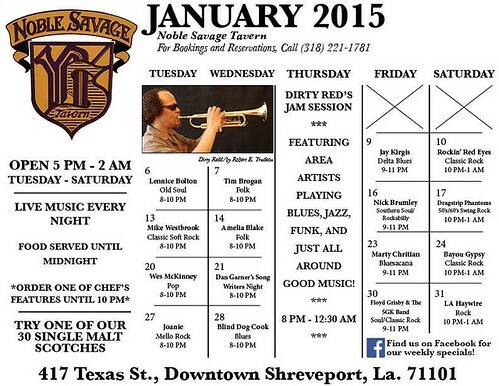 A toothsome supper washed down with an unusual beer, followed by an interesting musical performance: that's the ticket at Shreveport's downtown classic, the Noble Savage Tavern. "A change in Submission Dates for Critical Mass III plus other useful updates to the call are to be found at srac.squarespace.com, says Casey Jones. 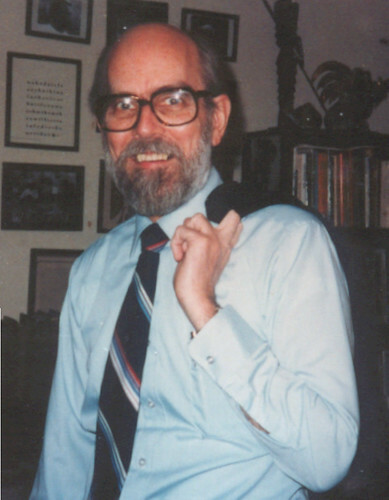 The late poet Miller Williams (1930 - 2015), studied at Hendrix, said the Arkansas Times. He taught at LSU and McNeese State for a number of years. Williams began teaching at Arkansas in 1970. He co-founded the University of Arkansas Press, which he directed for two decades. Folk singer Lucinda Williams is his daughter. He read his poem, "Of History and Hope," at Bill Clinton's second inauguration. At Centenary College, he was 1993 recipient of the John William Corrington Award. Said Centenary teacher and poet David Havird, "When the novelist Ernest Gaines accepted Centenary's invitation to become the second recipient (after Eudora Welty) of the John William Corrington Award for Literary Excellence, he recalled that decade when he was first publishing and observed, 'Many young Southern writers unknown then are known today. And much of that can be credited to Corrington and to Miller Williams.'" "To my ear," said Havird, "some of Williams's early poems, the more formal ones, bring John Crowe Ransom to mind - Williams wrote a critical study of Ransom - just as some of his poems from the 1980s bring Frost to mind with their conversational iambic pentameters and homespun philosophical ruminations, especially in his dramatic monologues, those poems spoken not by himself but by characters he's invented: the "serial murderer," for instance, 'who says something to the priest.'" "But he has more humor than Frost and a more liberal spirit, influenced as he was by the progressive Methodism of his clergyman father who was active in the Civil Rights Movement," continued Havird. "An excellent formal craftsman, Williams is as capable of producing a memorable line and image as he is of philosophizing. Of a woman waiting tables in a bar: 'Her smile smeared the air when she turned her head.'" If you go to the Arkansas Times obituary, you can read about one night in Lake Charles, 1952, when Williams bought Hank Williams a beer after a show. Having followed his work for some years as well as gone to him for advice, I can testify that Anthony Tony Reans is one of the best photo instructors and photographers in the area. Highly recommended workshops. 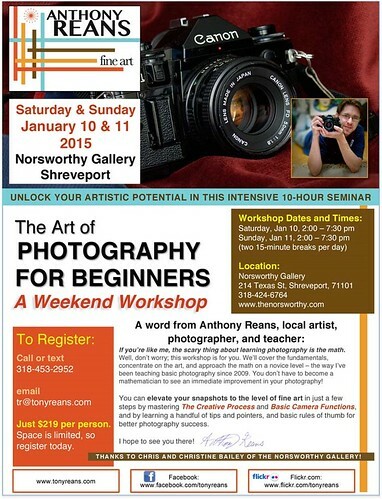 Info and registration: 318 453 2952, tr@tonyreans.com. 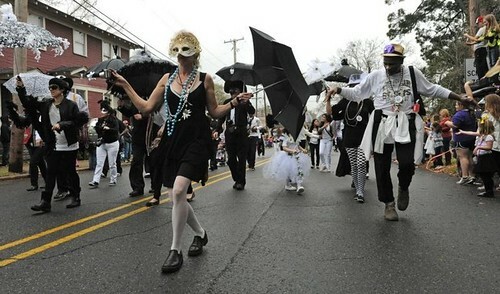 Always attempting to add the New Orleans vibe to North Louisiana's celebration of carnival, Blanc et Noir Marching Society members will march and second line the Krewe of Highland parade route for the 10th year, said Robert Trudeau in an announcement made recently in a tux, under a black bowler. "With a brass band as inspiration, face paint or a mask to provide the vibe, a brew and bellyful of red beans and rice for maintenance, this is a sustainable gang," said Trudeau. Big Chief and co-founder Jerry Davenport and Spyboy Marion Marks were, as they put it, "down with that." "We are open to new members," said Marks. "A fee of $35 pays for the band, throws and brunch," he noted. "It is one of the bargains of Mardi Gras season." "Returning members, please be so kind as to message one of us as to your participation this year!" begged Trudeau. Please see more at benms.org and at FB/Blanc et Noir. Photo of Talbot and Jerry by Stan Carpenter. 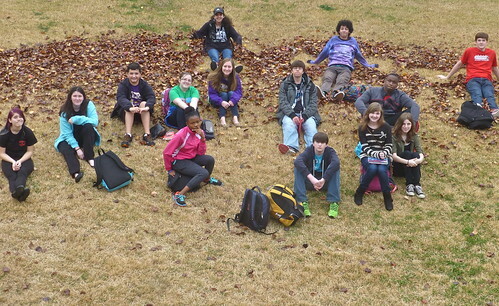 Caddo Magnet HS: 8th best secondary school in Louisiana. CE Byrd HS: 15th. In private high schools in Louisiana: Loyola College Prep, 8th best. Niche.com has undertaken a ranking of America's schools. Their Best Public High Schools section "ranks 14,431 high schools based on dozens of key statistics and 4.6 million opinions from 280,000 students and parents." They were founded in 2002 by Carnegie Mellon University students as CollegeProwler.com. "We’ve since grown into one of the largest content startups in the country," says Niche. While such evaluations are always arguable, Niche seems clear about its methodology. Part of each school's score is based on student interviews. Some of the quotes portray well spoken youngsters: "The healthy food options at Caddo Magnet High school are improving each and every year. Last year, our vending machines were not required to sell reduced fat items, but this year the school must have only reduced fat items in the vending machines." Other quotes leave a reader askance: "Some of the people from the office are very much disliked because of the way they handle certain situations. One example is a woman in charge of discipline or something and she doesn't do a good job of selecting the most innapporpriate of the bunch and it is clear to all of us at the school. Some of the office workers are doing their jobs and it makes us as the students dislike them understandably." There are additional rankings. In Best Academics - Public High Schools in Louisiana - Caddo Magnet is ranked 6th. In Best High School Teachers in Louisiana, Caddo Magnet is ranked 5th. In Best Administration, CE Byrd is ranked 5th and Caddo Magnet 7th. In Best Facilities, Byrd is 9th, Caddo Magnet is 12th. Regardless of the public's judgment as to the accuracy of such rankings, Niche.com is providing a wealth of easily readable info about schools. At first read, the stats seem presented clearly and in such a way that teachers and administrators, as well as parents and students, may well pay attention. Victoria Williams is a latter-day Lead Belly. In California her unadorned tunes and plain-spoken stories have captivated musicians and fans for decades. 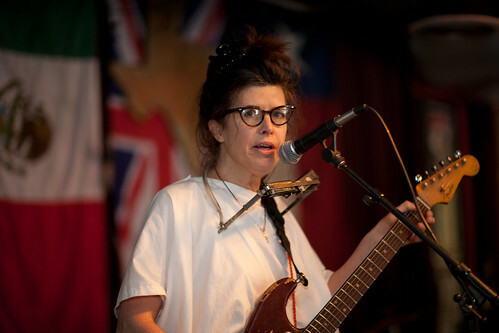 She is known globally for her tune "Crazy Mary," which has been performed by Pearl Jam and Lou Reed. Born and raised in Shreveport, she has been a Southern California moon child throughout her musical career. A series of interesting musical partnerships (and marriages) with figures such as Peter Case and Mark Olson (Jayhawks) have been part of the legend. DA Pennebaker made a movie about her: Victoria Williams – Happy Come Home. Numerous of her songs ("Century Plant," You R Loved") have become part of the American folk lexicon. 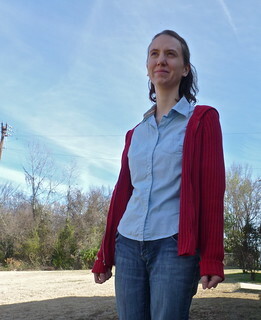 Williams will sing at Shreveport House Concerts, 1508 Fairfield Ave, on Sun, Jan 11, 7 pm. Reservations: http://shreveporthouseconcerts.org/reservations.html Email: reservations@shreveporthouseconcerts.org or 318 670 3567 .